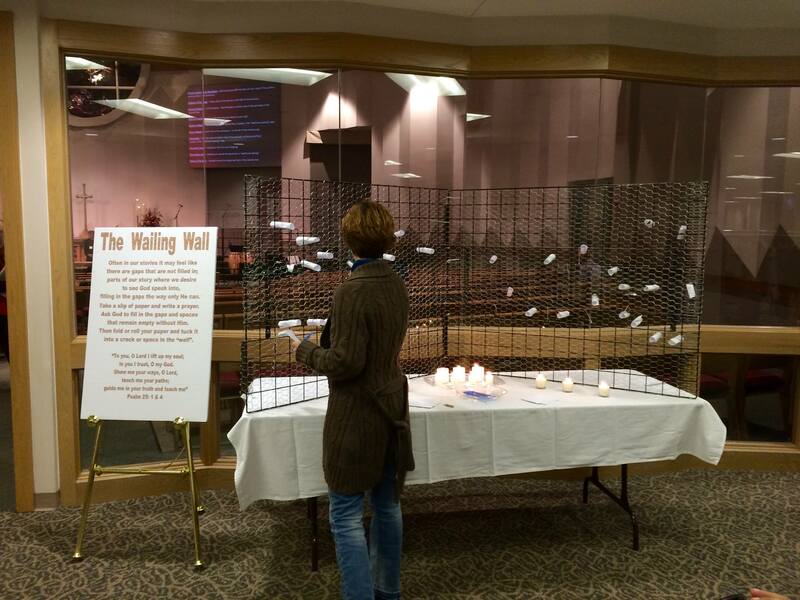 This contemplative prayer station is intentionally focused on our expression of personal longing. We yearn for God to fit the pieces together and fill in the gaps and brokenness of our daily lives. Cover the table with the white table cloth. Unroll the chicken wire and wrap it around the two metal frames. Cut the chicken wire using the wire cutters and secure using the zip ties. Lay the frames flat on the ground on top of each other. Along one side, attach the two frames together using zip ties. Sit the frames up and open like a book. Place the frame on the middle back of the table top to be used as a “wall”. Arrange the blank prayer papers and extra pens on the table. Place some candles around the table or in small groupings (a safe distance from the papers).Next to the table arrange the easel to display the instruction poster. Lead by example, write a few prayer requests and place the papers in the Wailing Wall. Often in our stories it may feel like there are gaps that are not filled in; parts of our story where we desire to see God speak into, filling in the gaps the way only He can. Take a slip of paper and write a prayer. Ask God to fill in the gaps and spaces that remain empty without Him. Then fold or roll your paper and tuck it into a crack or space in the wall.